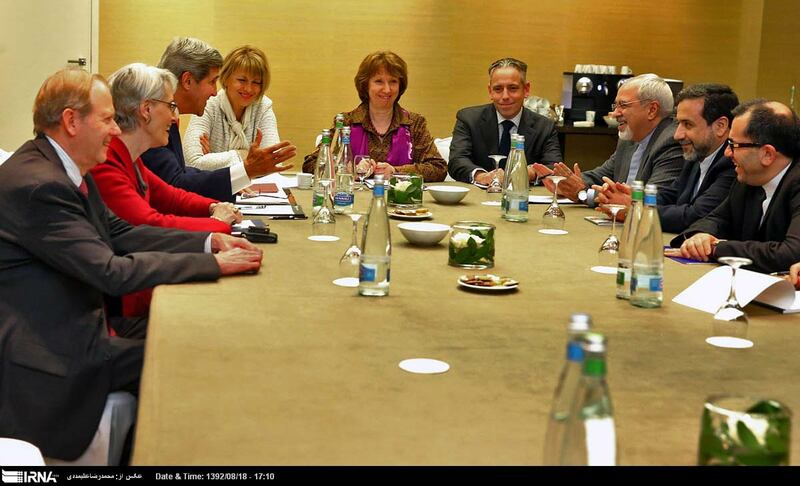 US Secretary of State John Kerry meets with Catherine Ashton, lead negotiator for the P5+1, and Iranian Foreign Minister Javad Zarif in Geneva on Nov. 9. After three days of intense, multidimensional talks in Geneva Nov. 7-9, the P5+1 (China, France, Russia, the United Kingdom, the United States, plus Germany) and Iran are closing in on a breakthrough, “first phase” deal that would verifiably halt the progress of Iran’s nuclear program. Although the most recent round of talks did not end with an agreement, the talks succeeded in closing many–if not most–of the remaining gaps between the two sides. They are closer now to resolving the decade-long standoff over Iran’s nuclear program than they have been since the 2005-2006 period when current Iranian President Hassan Rouhani led Iran’s negotiating team. A meaningful “first phase” agreement would pause Iran’s nuclear progress and address the most urgent activities of proliferation concern, primarily the production and stockpiling of uranium enriched to 20 percent and the deployment of additional and/or more efficient centrifuges, plus additional transparency measures, in exchange for 20% enriched uranium fuel for the Tehran Research Reactor and/or medical isotopes, plus limited and reversible relief from some the tough sanctions now in place against Iran. Reported differences that might exist between France and the other Western powers over how to handle the issue of the Arak heavy water reactor in a “phase one” and in the “final phase” of the negotiations can and should be resolved in the next few days. In an amateurish diplomatic blunder, French Foreign Minister Laurent Fabius made comments to the press in the middle of the negotiations. His remarks implied that the proposal put forward by the the P5+1 team, which included his own diplomatic representative, would not have done enough to address Arak. In reality, Arak has been a proliferation concern for many years and one of the core concerns of the P5+1 negotiating proposals, including their April 2013 proposal. However, not all issues can or must be settled at once. Arak represents a long term proliferation risk but is not a near term risk. The “first phase” of the deal does not have include a final resolution on the partially completed reactor. Iran has reported that the Arak reactor will not become operational until mid-2014. Construction work has lagged behind schedule for years and its start up may not be possible until even later. Furthermore, the reactor would have to be fully operational for at least year to produce spent fuel laden with plutonium and Iran does not have a spent fuel reprocessing facility to separate the plutonium. With the International Atomic Energy Agency (IAEA) inspecting the Arak reactor on a regular basis, the international community would also be made aware of Iran’s activities well in advance if it were seeking to separate plutonium for nuclear weapons. Comments from a senior U.S. official suggest that differences between Iran and the P5+1 over language regarding Iran’s nuclear Nonproliferation Treaty Article IV right to pursue peaceful uses of nuclear energy were an eleventh hour stumbling block in Geneva. To secure a deal, the P5+1 must eventually recognize Iran’s right under the Article IV of the NPT to pursue peaceful nuclear activities under certain conditions. As Obama said in his Sept. 24 address to the United Nations, such recognition requires that Iran adequately and satisfactorily respond to the international community’s concern about the nature of its program. To address those concerns, Iranian President Hassan Rouhani must follow through on his pledge for “greater transparency” by allowing broader IAEA access and more information about its current and past nuclear activities through steps such as implementation the additional protocol and fuller cooperation with the IAEA to resolve questions about suspected weapons-related experiments that may have been conducted over a decade ago. Iran took a step in this direction by signing an agreement with the IAEA Nov. 11 allowing the Agency broader monitoring access to key nuclear sites. With talks resuming on November 20 in Geneva, it is vital to maintain the momentum to work toward an agreement that addresses the most urgent proliferation concerns. As Secretary of State Kerry said in an interview Nov. 10, freezing Iran’s nuclear progress would “put more time back on the clock” and would open the way for a more comprehensive, more permanent agreement that rolls back Iran’s overall enrichment capacity–ideally to no more than 3,000-4,000 centrifuges–and provides more extensive IAEA inspection authority to guard against a secret weapons program. Policymakers in Washington and leaders in Israel who genuinely want to guard against a nuclear-armed Iran should be careful not to insist on ideal but unrealistic demands, such as zero enrichment or the complete dismantlement of Iran’s nuclear program. Such a deal may have been possible in 2005 when Iran had fewer than 300 uranium enrichment centrifuges at one site; but it is not realistic now that Iran has 19,000 installed and 10,000 operating centrifuges at two sites. Pushing for everything and getting nothing is foolhardy and dangerous. In the absence of a meaningful, realistic deal to limit Iran’s nuclear program, Iran will continue to increase its capacity to enrich uranium and expand its other sensitive nuclear fuel-cycle project. That, in turn, will increase the risk of Israeli military strikes against Iran’s nuclear sites. Such an attack would only delay, not stop, Iran’s nuclear pursuits, lead to a wider Middle East war, and likely push Iran’s leaders to openly seek the bomb. In the absence of a negotiated “first phase” agreement to pause Iran’s nuclear program, further sanctions against Iran would surely be legislated, but they would not halt or eliminate Iran’s nuclear weapons potential. Now is the time to finally secure a meaningful agreement on the basis of realistic and achievable goals. This entry was posted in Iran, Middle East, Non-proliferation, Nuclear Weapons and tagged Iran, Iran Nuclear, Iran Nuclear Program, Iran's Nuclear Program, P5+1, P5+1 Iran talks. Bookmark the permalink.